Do not attempt to have the walls of your self-build home plastered until you are satisfied that all electrical cables, conduit and backing boxes to pug sockets and light switches are in place. However tempting it is do not attempt to try to plaster the walls and ceiling yourself. Plastering is like icing a cake, every lump and bump will show and it is this that visitors will remember about your build; not the hard work you put in. A professional plasterer will complete a room in a day and transform a dull brick surface into a clean smooth canvas for decorating. Working above your head is not to be recommended as it can be tiring and then mistakes can happen. Scaffolding can help but only the professional should be let loose on your ceilings. Plasterboard has to be put onto the ceiling and the joins covered with a form of masking fabric or tape before it is plastered. This is not a job that can be done single-handed. You will need at least two people with strong arms to hold up the boards while they are nailed into position. 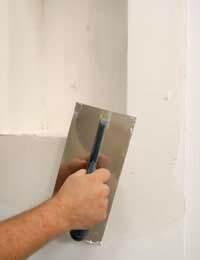 Before plasterboard is put on walls or ceilings ensure that insulating material if placed behind it for added warmth to the room and protection against noise. Simple curved coving can finish off the edges of a room. If walls are to be painted a different colour to the ceiling the coving will give a clean distinct line to work to. Never be tempted to use fancy carved coving and embellishments. This should be left for stately homes. You have to remember that one day you will want to sell your home and ornate plasterwork will detract from the rest of the house. Swirly Artex patterns on walls and ceilings is not only old fashioned it is really hard to remove and smooth out. If you think that by putting up rough Artex instead of employing a plasterer will save you money you will soon find it is a false economy. Dado rails should be used in older, high ceiling properties. They will probably be the wrong items to put on the walls of a newly built modern home. Also, when you come to remove them you will probably have to repair the marks left on plastered walls. It is possible to buy paint for newly plastered walls. It will go on better and give a good base for further painting at a later date. Strange as it sounds magnolia is a good colour for newly plastered walls as it is neutral while you decide on the décor and is acceptable if you decide to sell the house. Quite often new houses are dry lines. This is a form of plasterboard that is sealed before wallpaper is put on top. There are many modern styles of wallpaper on the market that will suit the house you have built. However, if you are thinking of moving in the near future consider painting the walls rather that putting up wallpaper as a neutral base is more attractive to buyers. I have a suitable plot, the planners don't think so - for an Underground/earth sheltered home, this article is fascinating but seems to jump from the outline position straight to plastering, with no words on the process through planning, whether PPS7 could help, and whether things like Code Level 6, sustainable or Passive is the way to go. There is no doubt in my mind that due to shortage of space, in time- earth sheltered and or underground houses will get a little easier to obtain permission, but currently its almost impossible.